"The goal of tattooing was never beauty. The goal was change. From the scarified Nubian priests of 2000 B.C., to the tattooed acolytes of the Cybele cult of ancient Rome, to the moko scars of the modern Maori, humans have tattooed themselves as a way of offering up their bodies in partial sacrifice, enduring the physical pain of embellishment and emerging changed beings. Despite the ominous admonitions of Leviticus 19:28, which forbade the marking of one's flesh, tattoos had become a rite of passage shared by millions of people in the modern age - everyone from clean-cut teenagers to hard-core drug users to suburban housewives." "The Statue of Freedom peered out into the misty darkness like a ghostly sentinel. Langdon always found it ironic that the workers who hoisted each piece of the nineteen-and-a-half-foot bronze statue to perch were slaves - Capitol secret that seldom made the syllabi of high school history classes." Langdon smiled. "Sorry, but the word occult, despite conjuring images of devil worship, actually means 'hidden' or 'obscured.' In times of religious oppression, knowledge that was counterdoctrinal had to be kept hidden or 'occult,' and because the church felt threatened by this, they redefined anything 'occult' as evil, and the prejudice survived." "Okay, and how many of you have ever been to Washington?" "So few?" Langdon feigned surprise. "And how many of you have been to Rome, Paris, Madrid, or London?" 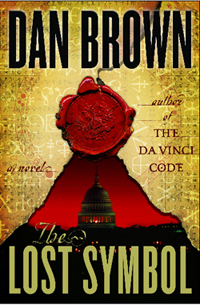 "Seriously," Langdon said, "Washington D.C., has some of the world's finest architecture, art and symbolism. Why would you go overseas before visiting your own capital?" "Okay. Now, what if I told you that Washington D.C., has every one of those things? Castles, crypts, pyramids, temples...it's all there." "She says Masonry is some kind of strange religion." "So tell me, what are the 3 prerequisites for an ideology to be considered a religion." "ABC," one woman offered, "Assure, Believe, Convert." "Correct," Langdon said. "Religions assure salvation; religions believe in a precise theology; and religions convert nonbelievers." He paused. "Masonry, however, is batting zero for three. Masons make no promises of salvation; they have no specific theology; and they do not seek to convert you. In fact, within Masonic lodges, discussions of religion are prohibited." "On the contrary. One of the prerequisites for becoming a Mason is that you must believe in a higher power. The difference between Masonic spirituality and organized religion is that the Masons do not impose a specific definition or name on a higher power. Rather than definitive theological identities like God, Allah, Buddha, or Jesus, the Masons use more general terms like Supreme Being or Great Architect of the Universe. This enables Masons of different faiths to gather together." "Sounds a little far-out," someone said. "Or, perhaps, refreshingly open-minded?" Langdon offered. "In this age when different cultures are killing each other over whose definition of God is better, one could say the Masonic tradition of tolerance and open-mindedness is commendable." Langdon paced the stage. "Moreover, Masonry is open to men of all races, colors, and creeds, and provides a spirituality fraternity that does not discriminate in any way." "If Masonry is not a secret society, not a corporation, and not a religion, then what is it?" "Well, if you were to ask a Mason, he would offer the following definition: Masonry is a system of morality, veiled in allegory and illustrated by symbols." "Sounds to me like a euphemism of 'freaky cult.'" "Hell yes!" the kid said, standing up. "I heard what they do inside those secret buildings! Weird candlelight rituals with coffins, and nooses, and drinking wine out of skulls. Now that's freaky!" Langdon scanned the class. "Does that sound freaky to anyone else?" "Yes!" they all chimed in. Langdon feigned a sad sigh. "Too bad. If that's too freaky for you, then I know you'll never want to join my cult." Silence settled over the room. The student from the Women's Center looked uneasy. "You're in a cult?" Langdon nodded and lowered his voice to a conspiratorial whisper. "Don't tell anyone, but on the pagan day of the sun god Ra, I kneel at the foot of an ancient instrument of torture and consume ritualistic symbols of blood and flesh." Langdon shrugged. "And if anyone of you care to join me, come to the Harvard chapel on Sunday, kneel beneath the crucifix, and take Holy Communion." Langdon winked. "Open your minds, my friends. We all fear what we do not understand." "Some found it suspicious that the Great Seal of the United States had 13 stars, 13 arrows, 13 pyramid steps, 13 shield stripes, 13 olive leaves, 13 olives, 13 letters in annuit coeptis, 13 letters in e pluribus unum, and on and on." "Don't find it unnerving that Masons meditate with skulls and scythes?" "No more unnerving than Christians praying at the feet of a man nailed to a cross, or Hindus chanting in front of a four-armed elephant named Ganesh. Misunderstanding a culture's symbols is common root of prejudice." "Known as the Unfinished Pyramid, it was a symbolic reminder that man's ascent to his full human potential was always a work in progress. Though few realized it, this symbol was the most widely published symbol on earth. Over twenty billion in print. Adoring every one-dollar bill in circulation, the Unfinished Pyramid waited patiently for its shining capstone, which hovered above it as a reminder of America's yet-unfulfilled destiny and the work yet to be done, both as a country and as individuals." "Even the Bible concurs," Bellamy said. "If we accept, as Genesis tells us, that 'God created man in his own image,' then we also must accept what this implies - that mankind was not created inferior to God. In Luke 17:20 we are told, 'The kingdom of God is within you.'" "I'm sorry, but I don't know any Christians who consider themselves God's equal." "Of course not," Bellamy said, his tone hardening. "Because most Christians want it both ways. They want to be able to proudly declare they are believers in the Bible yet simply ignore those parts they find too difficult or too inconvenient to believe." Langdon gazed up at the library's celebrated statue of Moses. "Yes." "But do you know why he has horns?" Like most teachers, Langdon did not enjoy being lectured to. The Moses above them had horns for the same reason thousands of Christian images of Moses had horns - a mistranslation of the book of Exodus. The original Hebrew text described Moses has having "karan 'ohr panav" - "facial skin that glowed with rays of light" - but when the Roman Catholic Church created the official Latin translation of the Bible, the translator bungled Moses's description, rendering it as "cornuta esset facies sua," meaning "his face was horned." From that moment on, artists and sculptors, fearing reprisals if they were not true to the Gospels, began depicting Moses with horns. "It was a simple mistake," Langdon replied. "A mistranslation by Saint Jerome around 400 A.D."
Bellamy looked impressed. "Exactly. A mistranslation. And the result is...poor Moses is now misshapen for all history...I mention the horned Moses, to illustrate how a single word, misunderstood, can rewrite history." "Gold resists the entropic laws of decay; that's one of the reasons the ancients considered it magical." "Since the days of Michelangelo, sculptors had been hiding the flaws in their work by smearing hot wax into the cracks and then dabbing the wax with stone dust. The method was considered cheating, and therefore, any sculpture "without wax" - literally sine cera - was considered a "sincere" piece of art. The phrase stuck. To this day we still sign our letters "sincerely" as a promise that we have written "without wax" and that our words are true." "Humans who spoke to invisible forces and requested help were a dying breed in this modern world." Amon, Mal'akh corrected. Egypt is the cradle of your religion. The god Amon was the prototype for Zeus...for Jupiter...and for every modern face of God. To this day, every religion on earth shouted out a variation of his name. Amen! Amin! Aum! CAN YOU WEIGH A HUMAN SOUL? The notion was impossible, of course...foolish even to ponder. Her brother stared at the strange machine. "An incubator?" "See if this helps you guess," Katherine said. "A scale?" Peter asked, looking puzzled. "Not just any scale." Katherine took a tiny scrap of paper off a nearby counter and laid it on the capsule. "High-precision microbalance." she said. "Resolution down to a few micrograms." Peter still looked puzzled. "You built a precise scale for...a person?" "Exactly." She lifted the transparent lid on the machine. "If I place a person inside this capsule and close the lid, the individual is in an entirely sealed system. Nothing gets in or out. No gas, no liquid, no dust particles. Nothing can escape - not the person's breathing exhalations, evaporating sweat, body fluids, nothing." A very old man in an oxygen mask lay inside. "The man in the capsule was a science teacher of mine at Yale," Katherine said. "He and I have kept in touch over the years. He's been very ill. He always said he wanted to donate his body to science, so when I explained my idea for this experiment, he immediately wanted to be a part of it." "That's his body weight." Katherine said. "This is what he wanted," Katherine whispered. "Watch what happens." Over the course of the next sixty seconds, the man's shallow breathing grew faster, until all at once, as if the man himself had chosen the moment, he simply took his last breath. Everything stopped. Wait for it, she thought, redirecting Peter's gaze to the capsule's digital display, which still quietly glowed, showing the dead man's weight. When Peter saw it, he jolted backward, almost falling out of his chair. "But...that's..." He covered his mouth in shock. "I can't..."
Moments after the man's death, the numbers on the scale had decreased suddenly. The man had become lighter immediately after his death. The weight change was minuscule, but it was measurable...and the implications were utterly mind-boggling. Katherine recalling writing in her lab notes with a trembling hand: "There seems to exist an invisible 'material' that exits the human body at the moment of death. It has quantifiable mass which is unimpeded by physical barriers. I must assume it moves in a dimension I cannot yet perceive." "But isn't the Apocalypse about the end of the world? You know, the Antichrist, Armageddeon, the final battle between good and evil?" Solomon chuckled. "Who here studies Greek?" "What does the word apocalypse literally mean?" "It means," one student began, and then paused as if surprised. "Apocalypse means 'to unveil'...or 'to reveal.'" Solomon gave the boy a nod of approval. "Exactly. The Apocalypse is literally a reveal-ation. The Book of Reveal-ation in the Bible predicts an unveiling of great truth and unimaginable wisdom. The Apocalypse is not the end of the world, but rather it is the end of the world as we know it. The prophecy of the Apocalypse is just one of the Bible's beautiful messages that has been distorted." Solomon stepped to the front of the stage. "Believe me, the Apocalypse is coming...and it will be nothing like what we were taught." "Teachers teach Peter. We speak openly. Why would the prophets - the greatest teachers in history - obscure their language? If they hoped to change the world, why would they speak in code? Why not speak plainly so the world could understand?" "Robert, the Bible does not talk openly for the same reason the neophytes had to be initiated before learning the secret teachings of the ages...for the same reason the scientists in the Invisible College refused to share their knowledge with others. This information is powerful, Robert. The Ancient Mysteries cannot be shouted from the rooftops. The mysteries are a flaming torch, which, in the hands of a master, can light the way, but which, in the hands of madman, can scorch the earth." "Peter, I hear you - I do. And I'd love to believe we are gods, but I see no gods walking our earth. I see no superhumans. You can point to the alleged miracles of the Bible, or any other religious text, but they are nothing but old stories fabricated by man and then exaggerated over time." "I'm no Bible scholar, but I'm pretty sure the Scriptures describe in detail a physical temple that needs to be built. The structure is described as being in two parts - an outer temple called the Holy Place and an inner sanctuary called the Holy of Holies. The two parts are separated from each other by a thin veil." Katherine grinned. "Pretty good recall for a Bible skeptic. By the way, have you ever seen an actual human brain? It's built in two parts - an outer part called the dura mater and an inner part called the pia mater. These two parts are separated by the arachnoid - a veil of weblike tissue." Langdon cocked his head in surprise. Gently, she reached up and touched Langdon's temple. "There's a reason they call this your temple, Robert."